As flagship of the Century Boats single-engine fleet, the Century 2301 CC (LOA: 23′, Beam: 8′ 6″) provides a solid platform built for speed, agility and range. Designed as a definitive fishing machine, the 2301 CC delivers contemporary styling, luxury and performance. Weighing 4,150 pounds without engines, and powered by a single 300-hp Yamaha outboard, the 2301 CC jumps onto plane in 3.4 seconds and tops out at more than 50 mph. At a cruising speed of 28 mph, the boat’s range is 418 miles. 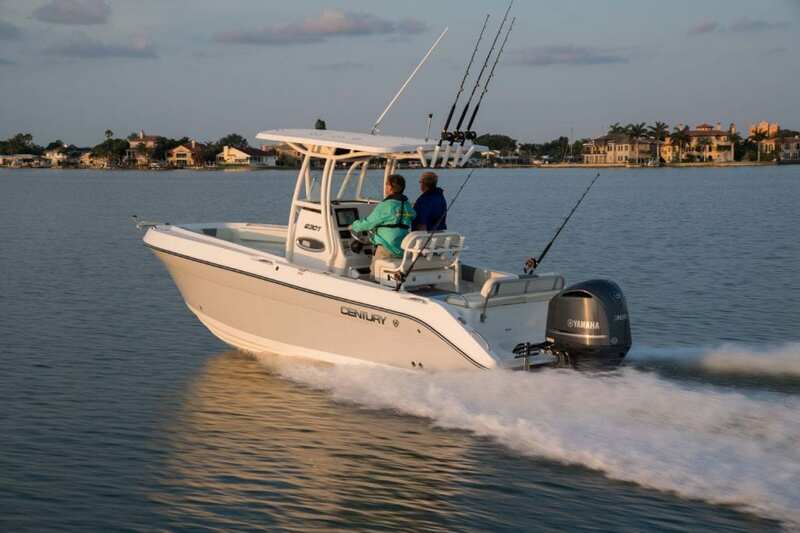 The Century 2301 CC offers fishing features and comfort amenities needed for a demanding day on the water. Standard items include a powder-coated leaning post with tackle storage, raw-water wash down, freshwater shower, and trim tabs with lighted indicators. Also standard: a powder-coated hardtop with integrated spreader lights, onboard marine head and a wraparound bow seating area.